OurHood celebrates and honours Nelson Mandela, and what would have been his 100th birthday. An anti-apartheid revolutionary. A philanthropist. A prisoner. A President. A leader. A role model. Nelson Mandela was South Africa’s first black head of state and the first to be elected in a fully democratic election. Nelson Rolihlahla Mandela, or The Father of the Nation, as he was, and still is, lovingly known, was born in Mvezo, in the Eastern Cape, on the 18th of July 1918. Mandela studied law after school, and first worked as a lawyer before becoming involved in anti-colonial and African nationalist politics. In 1944, he joined the ANC and co-found its Youth League. After the National Party’s white-only government established apartheid, he and the ANC committed themselves to overthrow its control and strive for an equal society for all South Africans. Initially, Mandela was committed to non-violent protest. However, in 1961, he led a sabotage campaign against the government. In 1962, he was arrested for conspiring to overthrow the state and sentenced to life imprisonment in the Rivonia Trial. Mandela served 27 years in prison, split between Robben Island, Pollsmoor Prison, and Victor Verster Prison (known today as Drakenstein Correctional Centre). Due to growing domestic and international pressure, and fears of a racial civil war, former President F. W. de Klerk released Mandela from prison in 1990. Mandela and De Klerk negotiated an end to apartheid, resulting in the 1994 multi-racial, general election. Mandela was voted in as President of the country. President Mandela created a country where people from all walks of life, all backgrounds, all cultures, have equal rights. Thus, he became known worldwide as an icon of democracy and social justice. He received more than 250 honours — including the Nobel Peace Prize. Mandela Day is celebrated every year, on Mandela’s birthday, the 18th of July. Mandela Day is an international call to action campaign officially declared by the United Nations in November 2009. The former President was honoured and hoped this day would bring people together from around the world to fight poverty and promote peace, reconciliation and cultural diversity. Mandela made an imprint on the world for 67 years. Therefore, the idea is for individuals to devote one minute of their time for every year of his devotion to public service. At OurHood, we strive for a better South Africa by providing a safe and secure (online) platform and mobile application for residents within their neighbourhoods to communicate with one another and work together to create better neighbourhoods for themselves. This allows for neighbours to create positive relationships and in turn, improve the country, one suburb at a time. OurHood is proof that anyone, no matter who they are or where they come from, people are able to make a difference. No matter how big or small, ultimately, a number of small positive initiatives can have a major impact on many individuals and the neighbourhood itself. TEARS is a pro-quality life, registered NPO, that rely on the support of individuals and corporates to assist them. They’re not only celebrating Mandela Day on the day, but making a whole weekend out of it too. Take your tool box with, and get involved with some wooden DIY projects. Get involved with some gardening. Improve the cattery and play area for the cats. Bring some donations for the charity shops. Over the weekend, there will be the Muttley Market, which will include craft tables, treats, eats and drinks, and TEARS merchandise. In association with Leap Science and Maths Schools, Rhodes Foods, the Hyprop Foundation and HeartFM, Canal Walk is building a giant mosaic of Nelson Mandela using your Rhodes Quality can food donations. Simply order muffins, R20 each, to be collected on Mandela Day. Your R20 will provide two people with a warm, safe shelter and meal for a night at The Haven Night Shelter. Volunteers can also help by baking muffins on the 17th and 18th of July. Create a lasting change simply by playing a round of golf! All motorbike types and scooters are welcome to join this Mass Ride on Sunday, 15 July, from Houghton, Johannesburg to Pretoria. Participation fee: A packet of sanitary pads, “or as many as you can carry”. If you want to support the Bikers for Mandela Day, but you can’t or you don’t have a bike, you can donate R180, which will be used to purchase sanitary pads and keep one girl in school for an entire year. The VIVA Foundation is a registered is an NPO and Public Benefit Organisation. Their strategy is to effectively address a community’s needs by creating a secure hub within an informal settlement. They have proven themselves within the charities sector as a “social enterprise with an above average, doable and effective strategy for service delivery”. This will focus on poverty alleviation, Viva Kids and Viva Village Independent School. There will be painting, gardening, cleaning, cooking and feeding the kids, art, music, play, small-business consulting etc. This will focus on SAPRI Sexual Violence Prevention. House visits, training, putting up posters and awareness material. This will focus on vegetable gardening and animal land management. This will focus on the children of the community, including school readiness workshops, soccer, painting, gardening, cooking and cleaning. The Richards Bay Caravan Park is collecting (dry) food, every day, up until Tuesday, 17 July, which will be donated to local charities. They are also running a competition, asking you to post a selfie to their Facebook page, and you could win a dinner for 2 at the beautiful Imvubu Lodge. Help the KZN Children’s Hospital to construct our Rainbow Tower by buying a brick for R100, either on the day or email: [email protected] for more information. Angel Projects started in 2010 by Brenda Scheepers, combining her passion for the less fortunate and business experience to address growing needs within local communities across South Africa. This Mandela Day, Angel Projects is hosting a “ race” inside the Gateway Shopping Centre. Teams of 3 will receive a shopping voucher and a shopping list presented in the form of clues. Teams will have 67 minutes to shop for the relief hampers; including a few short fun challenges in the spirit of Mandela Day. Various Relief Hampers will be packed: Food and dignity hampers, as well as school supplies. Volunteer your time at any Pick ‘n Pay stores in Cape Town, Johannesburg, Durban, Port Elizabeth, Rustenberg or Bloemfontein. 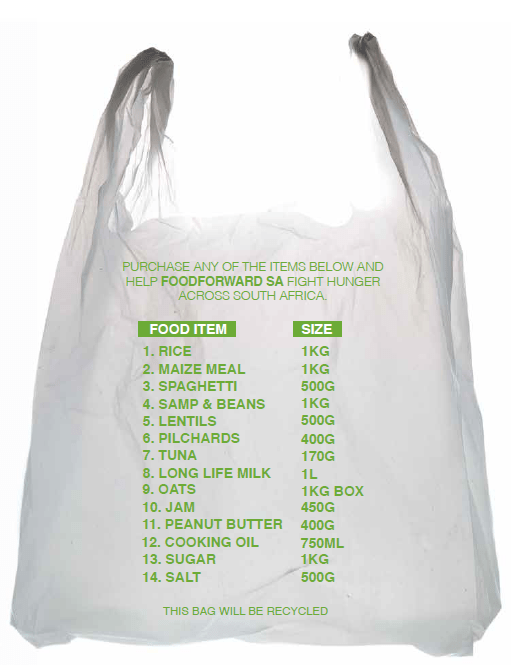 Hand out branded shopping bags and encourage shoppers to buy selected non-perishable food items and donate them to FoodForward SA. Encourage your staff and colleagues to spend 67 minutes at the Packing Events in Cape Town, Johannesburg, Durban, Port Elizabeth, Rustenberg or Bloemfontein, to sort and pack the donated groceries for distribution to our Beneficiary Organisations during winter. Visit your nearest Pick ‘n Pay store, purchase the selected food groceries and donate them in the marked bin(s). Commemorating the centenary of Nelson Mandela’s birth, t-shirts have been on sale (locally and internationally) since the 16th of June, Youth Day, to be sold as part of a broader campaign supporting the Nelson Mandela Foundation centenary initiatives. The t-shirts have Mandela’s face on them, formed out of 240 words chosen to highlight Madiba’s values, vision and legacy. Mandela Centenary T-shirts can either be bought from the Nelson Mandela Foundation’s offices, online or from retail stores countrywide. On Wednesday, 18 July, Mandela Day, DStv will launch a five-day long pop-up channel to celebrate and honour the legacy of Tata Madiba. DStv’s Mandela 100 Tribute Channel will be available to all DStv customers across Africa, on channel 199. The channel will feature a remarkable mix of films, documentaries, archive footage from M-Net’s multiple award-winning journalistic programme, Carte Blanche, as well as exclusive celebrity interviews. For the full schedule, go to DStv.com under The Guide, the TV Guide and EPG (Electronic Programming Guide) on your decoder, or the TV Guide on DStv Now. What will you and your community be doing this year for this extra special Mandela Day?